Replacing My Alternator and Diagnosing/Partially Fixing the Radiator Fan. So driving up from Nevada I had a more serious problem than the overheating issues I had been experiencing… this time I was crossing the panhandle in Idaho, heading into Washington when the warning light for the charging system came on… just before it happened I had been talking to Tim on the phone, I was planning to meet up with him… but a quick visit to a mechanic changed my plans as apparently my alternator had failed for 20mins or so… they said they got it to fail again and recommended I replace it… I asked for a quote… $500 seemed pretty steep. Some though, and I eventually decided to to drive to Canada – I could buy one from O’Reilys for about $200. A policeman pulled over… I thought I was going to get in trouble, but he was super friendly and just making sure I was all good. Later, this friendly guy named Mat pulled over to likewise offer help… but there was nothing much to do but wait for the engine to cool, and traffic to die. He did give me some valuable beta on what was down the corner of the nearby exit. Once cool, I started the car and once moving put it in neutral and rolled down with the engine off. I then started it and after a light or two, pulled into the McDonald/Starbucks cafe. I filled up my now empty water containers and then went into Starbucks to use the internet, watching some videos on alternator replacement. It wasn’t long before I saw Mat walking over to me! His daughter Carley was with him too! They were just checking in on me… But, I ended up joining them for some food at a nearby restaurant… and when we got back I gave them some of my fruit and veg as I didn’t think I could take it across the border – as it turned out they didn’t even ask. I headed out driving north a ways before getting some sleep at a rest stop. The next morning I picked up an alternator from O’Reileys and was soon crossing the border into Canada. Overheating meant that I was now catching the ferry on a public holiday and it was 100% full. I ended up getting a through fare, meaning I had to go to the main island and then catch another ferry back to Salt Spring… it also cost more… apparently only because of weekend prices… (I was told it cost the same amount compared to a direct fare). I pulled in at the Hart’s place and met Haidee who was surprised to see me – she hadn’t seen my email – when I checked the timestamp on it I realised I had only sent in a day and a half ago – I thought it had been longer… It was nice catching up with them again and seeing all Jacob’s new magic tricks. He is so much better than last time! The next day I set to work on my van. First step was getting it up onto some blocks with the wheels pointed to the right so I had room to work. Josh was out for the day and he was letting me use his workshop which was super nice (it was being built last time I was here and I could see a couple of the beams I had helped put up). 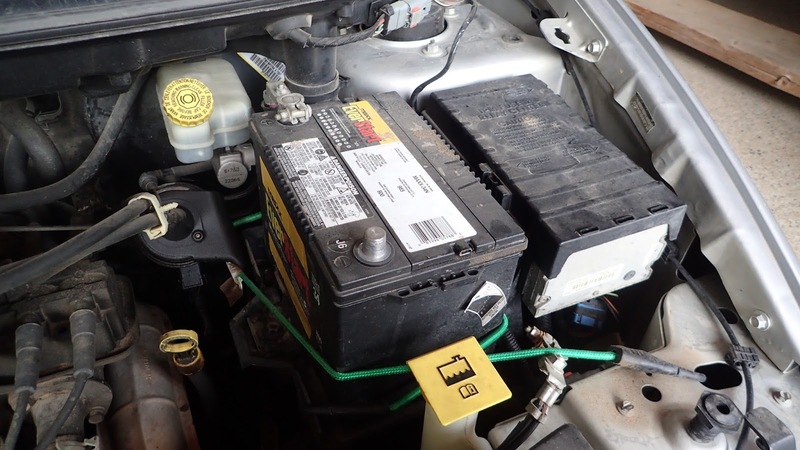 Since I was working on the charging system, everything I had watched as well as common sense said to disconnect the battery. I then removed the plastic shroud that covers the belt. It is held on by 4 plastic “christmas tree” clips. I thought I would pry them of with some screwdrivers, but it was easier to just pull on the shroud. I could then see the belt and various pulleys it ran around. I released the tensioner using a crowbar. I then tried removing the clip from the EDR valve. It was tough and I ended up removing the nut from the alternator post and then coming back to it. Removing the clip was probably the hardest thing on the whole job! 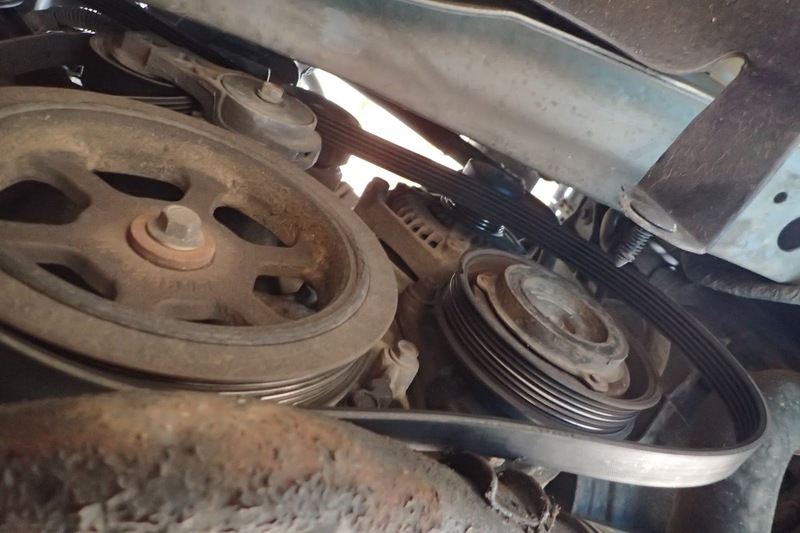 Next I had to remove the three bolt holding the alternator in place. The one near the dip stick was a little tricky a long spanner would probably be the best tool. I ended up using some ratchet extensions with one of those swivel attachments. With that done the alternator was loose, but I couldn’t remove it because there wasn’t enough room. One video I had watched removed the EDR valve, which I wasn’t keen on doing. Instead I did what was shown in another video, that is to removed the radiator cover and the front cross member. After doing this there was enough play in the radiator to make enough space for it to come out. Doing it this way meant I didn’t have to worry about gaskets and that sort of thing, also I had a fan problem, so I could have a look at that while I was at it! 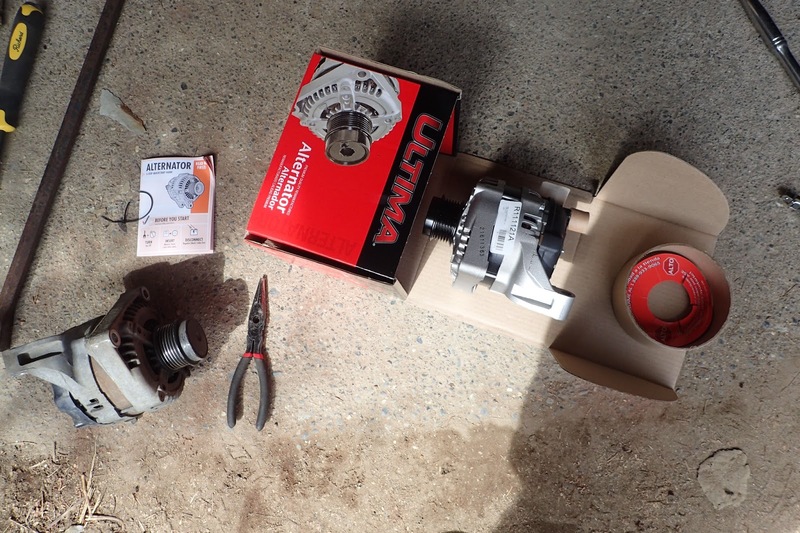 I now unpacked the new alternator and fit it in place. After plugging the cables back in and putting the belt back on, I did a little test run before bolting everything else back in place. 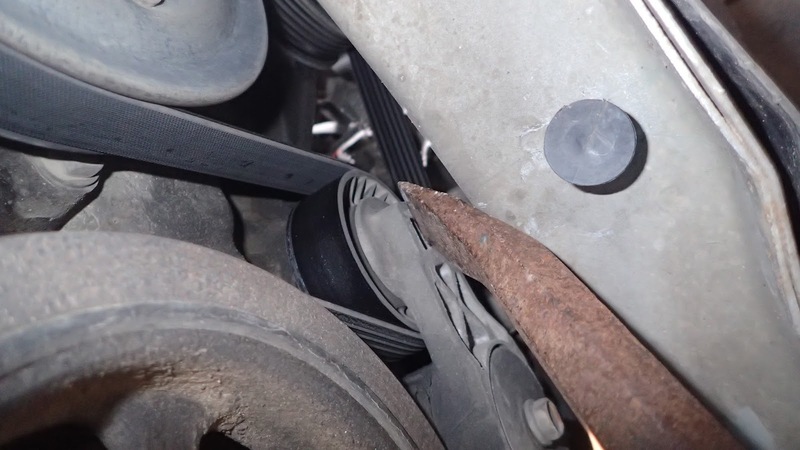 Everything seemed to be working so I decided to have a look at the radiator fan… there where only two further bolts holding the fan unit in place. After removing the overflow hose, with some careful manoeuvring I found I could pop the radiator out from under the main radiator hose… spinning the fans you could feel there was something wrong with one of them. The motor had seized/wasn’t spinning properly. I then took out the fan relay and was going to short the terminals, but noted that the radiator fan fuse had blown… with the presumed faulty fan disconnected and, after replacing the blown fuse, I managed to get the other fan to kick in! I zip tied the loose cable so it wouldn’t get caught in anything and went for a test drive with the intention of checking out the Salt Spring markets. I just got back from a test drive and the fan is kicking in and out as it should be! Yay!